Our top pick for the all round best bathroom sealant? Check out Everbuild’s 500. Welcome to our 5-minute guide to the best bathroom sealants. In our list below is a range of the top selling silicone sealants suitable for finishing up tiles, shower trays, cubicle doors, bathtubs, sanitary ware and more! The silicone you use and how it looks after application, is the finishing touch on a bathroom that’s likely to have cost thousands of pounds. Given even the best bathroom and shower sealants tend to cost less than £10, you’re risking ruining the look of your bathroom, to save £1-2; not worth it. Below, we’ve covered the top 4 anti-mould bathroom and shower sealants that are currently available in the UK, and sold throughout popular bathroom, plumbing and tiling merchants. Here’s a top seller, and not just online. 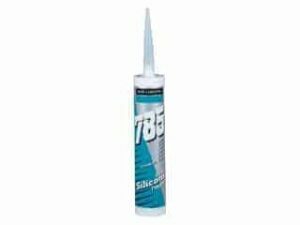 Like the Dow 785 we’ve mentioned on this list, the Everbuild 500 sealant was a best seller at my time working at a local plumbing merchants; and for good reason. Everbuild 500 has anti-bacterial properties to prevent mould build-up; you won’t get that with cheap no-name silicone brands. All bathroom sealants are waterproof. That’s one of things that make them bathroom silicone, not your average silicone. However, make sure you check the label of the silicone you’re buying. Not ALL bathroom and shower sealants are anti-mould. So, whilst you might be able to get the perfect finish to begin with, this is going to fade quickly. Once mould starts to set in silicone, it’s REALLY hard to remove. In fact, the quickest way to remove mould from bathroom sealant, is to remove the silicone completely, and start again. Basically, it makes sense to ensure you have a waterproof and anti-mould sealant to start with, rather than having to reseal your bathroom a year or so down the line. The thing with Everbuild 500, isn’t just the fact that it has anti-mould (via a Fungicidal formula) properties. Its format means that the silicone won’t discolour with age. And that’s a huge bonus. A lot of cheap bathroom sealants will discolour after 9-12 months, even if the seal is still solid, and mould hasn’t found its way in. Either way, once silicone discolours in your bathroom, your bathroom looks aged. That’s going to mean reapplying silicone once every year; but not with Everbuild 500. Like Dow 785, you’ll get a quick drying time with the Everbuild 500. Expect it to be tacky within 45-60 minutes. Better still, it won’t pick up dirt when its drying and when it’s bone dry (24-36 hours), it’s permanently flexible, which reduces the chances of the seal breaking. You’ll be able to use the Everbuild 500 in all aspects of bathroom sealing. That means everything from sanitary ware and shower trays, to basins, baths and even showers doors. And, you can go ahead and see what other people think of the Everbuild 500 bathroom sealant. Across multiple ecommerce stores, there are over 100 reviews from satisfied customers that have used this product in their new bathroom. Looking to finish up your bathroom with a product that doesn’t age? Everbuild 500 is the silicone for you. 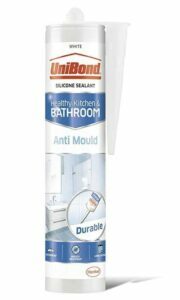 Next, we’ve got the anti-mould sealant from UniBond. For those that don’t know. UniBond is one of the most popular brands for all kind of finishing products. That’s everything from plaster, through to shower tray sealant. And, it’s not a small company. They employ 50,000 people globally. You don’t employ that many people, selling products at £10 or so per-pop, unless your products are the best-of-the-best. Like Everbuild, you’ll get some anti-mould protection built-in to the UniBond bath sealant, keeping it look fresh for years to come. For the average trades person, having the need to reseal a tube isn’t really a big deal; they’ll go through more than one daily. But, what if you’re patching up round a bath, or a DIYer looking to do bits at a time? UniBond is one of the few bathroom silicone manufacturers that have integrated a resealable cap into their tube design. That means you’ll be able to store it and use it again. There are a handful of top shower sealants online, that get a tonne of rave reviews. Of all of them, it’s UniBond that gets the most. That’s because the price is fair, the quality is high, and it’s one of the few bathroom sealants that are reusable. And, if you’re just patching up, that’s going to save you buying a new tube of silicone next time. UniBond is strong and reliable, and using it relies on preparation. Dow Corning are another huge brand when it comes to silicone. And, there Dow 785 shower, bath and sanitary sealant is one of their biggest sellers. Essentially, the Dow Corning 785 is constructed in a similar way to UniBond. It incorporates anti-bacterial properties. Resisting bacteria means it resists mould. This is mainly due to the fungicide formula that’s built into Dow 785. That’s not going to just keep your bathroom looking fresh, but smelling fresh too. One reason people love Dow 785, is the fact it’s quick drying. That’s important, because the longer silicone needs to dry, the more chance that dust and dirt finds its way in. And, that’s going to completely ruin the finish of a bathroom; back to square one, ripping off the silicone, ready to apply again. UniBond certainly has more online reviews than any other of the best bathroom sealants on the market. But, that’s not to say that Dow 785 is junk. Far from it in fact. At my time working at a plumbing merchant’s, this is the sealant we sold the most of; dozens of tubs per day. When looking through online reviews for bathroom and shower sealants, it’s important to realise that personal preference is an important thing with all kinds of plumbing and heating tools and materials. Some trades people and DIY enthusiasts prefer UniBond, and others prefer Dow 785; it’s as simple as that. Everbuild make a tonne of different bonding products, including their popular C3 ShowerProof Sealant. As we’ve mentioned, you don’t want any sealant in your bathroom that doesn’t have either anti-bacterial or anti-mould properties. And, with the Everbuild C3, you’ve got anti-fungal properties that reduces the chance of mould finding its way into the silicone. Once that flexible rubber seal is in place, nothing is getting inside it. Like all the bathroom sealants on this list, you’ll be able to find plenty of positive online reviews for the Everbuild C3. If you’re looking for alternative to the UniBond and 785 mentioned above, Everbuild should be the top of your shortlist. And don’t forget, if you’ve not got one already, you’ll need a caulking gun, and a silicone finishing tool. There’s plenty of durable but cheap caulking guns available here. And, you can grab the best silicone finishing tools here. Thanks for reading our 5-minute guide to the top anti-mould bathroom sealants. We regularly post up reviews on bathroom products, and free plumbing advice, so bookmark our blog and drop back soon. And, if you have any questions, leave a comment below and we’ll get back to you as soon as possible.